For the first time on my trip, I was in a hurry. Having spent a leisurely couple of weeks stopping off at every ruined temple and sight I wanted to visit on the way up to the Burmese border in the far north of Thailand, I was now on a deadline to get to Penang with enough time spare to make all the arrangements for my passage to India. Adherence to tight itineraries was a Western way of thinking that I’d already discovered didn’t work in Southeast Asia, where it was foolish to rely on ever being anywhere at any particular time. 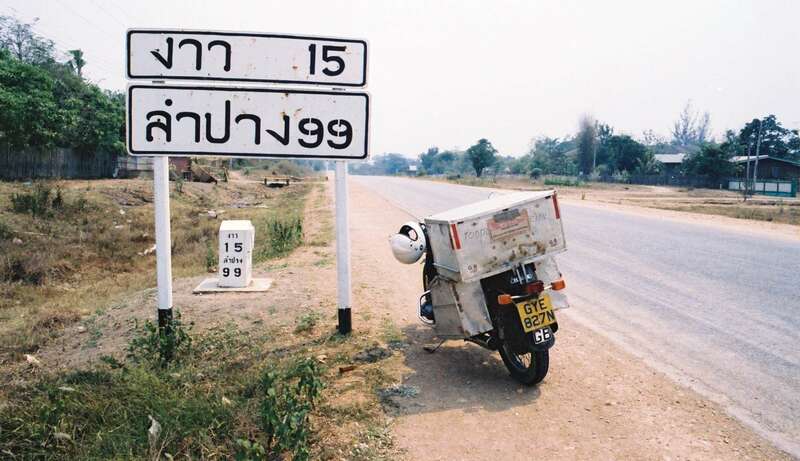 Fortunately, the smooth roads of Thailand were among some of the best I’d encountered so far. It was the wildlife wandering randomly across them that was the problem. 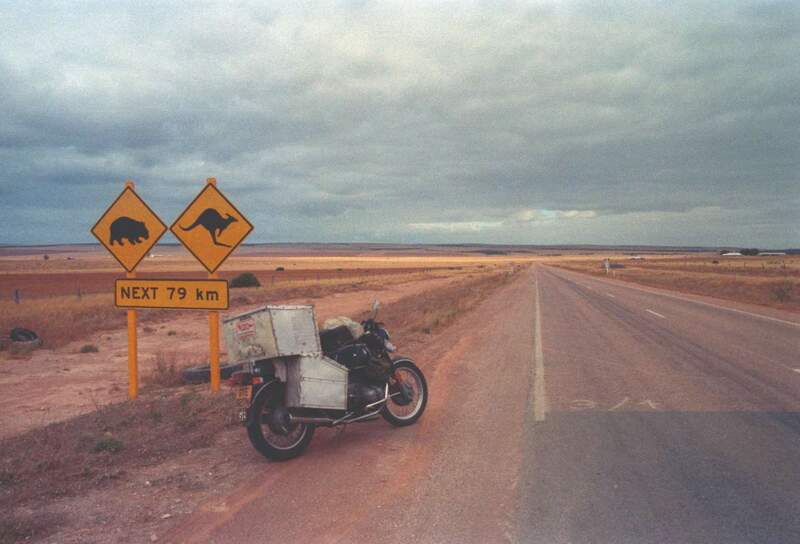 But with the good roads and my time limited, I increased my speed, riding faster as I became more carefree. That’s when I hit the dog. 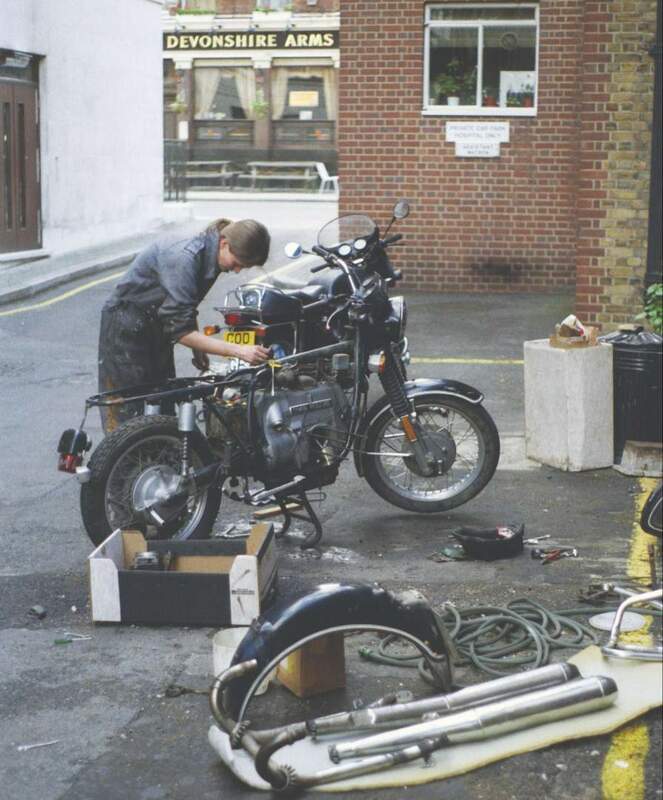 Elspeth tuning up her beloved bike before heading out on her epic trip. It ran out from behind a truck travelling in the opposite direction and was under my front wheel before I even had a chance to brake. Within seconds I was sliding up the road watching my bike as it disappeared out of sight into a ditch. It all happened so suddenly and unexpectedly, there was nothing I could do. When everything had stopped moving I staggered to my feet. I looked around but the dog was gone. I limped over to my BMW, which had hit a tree and now had its front wheel and exhaust wedged against its trunk. My metal pannier boxes had been ripped off the back of my bike and the mirrors, indicators, and other parts were scattered all over the road. As I tried to pull my bike free I noticed my bloody handprints all over the front wheel. I stopped and assessed my injuries. I was battered and bruised all over, a total mess. But I didn’t care. All that mattered to me, all I could think about, was getting my bike back on the road and reaching Penang in time to catch my boat to India. 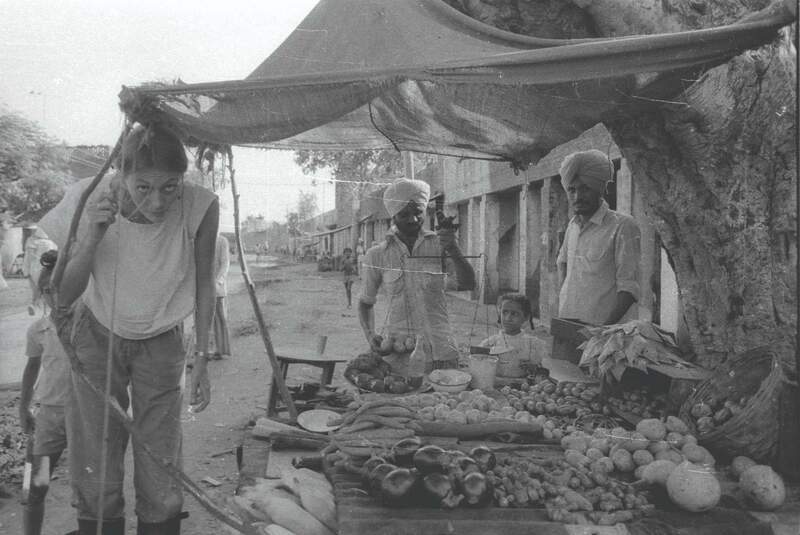 Buying food at a roadside stall in the state of Rajasthan in northwestern India. While I’d been contemplating my predicament, five men had appeared from a small farm on the side of the road. I got them to help me pull the bike off the tree, out of the ditch, and up onto the side of the road. She was a sorry sight. We’d taken a hammering, my bike and I, although it was not as bad as previous injuries. This time at least we were both still standing, each of us vaguely in one piece. But that cargo ship wasn’t going to wait for us, so I immediately set about getting us back on the road. First the BMW. Then me. Eyes on the ground, limping as I kicked through the long grass along the road’s edge, I searched the surrounding area for my bike’s missing parts. Beside me, the farmers tapped my shoulder, attempting to make me sit in the shade and rest. After a few minutes they gave up and joined me. Within ten minutes we’d located everything and I was sitting, as they’d instructed, on a wooden platform in the shade of a large tree at the side of the road, surrounded by a large crowd of Thais. They came in every combination of age, generation and height. Women with babies clamped to their hips, men with stubby cigarettes between their lips. I guessed they were all one big family, staring at me while I clenched my teeth as the mother of the farm dabbed at my wounds with alcohol and poured Mercurochrome, a bright pink antiseptic they called curo, all over my hands, legs, and knees. When she was finished I removed a pair of flimsy shoes I’d bought in Australia. Wishing I’d worn my protective motorcycle boots, I looked at my swollen toes. At least two of them appeared to be broken. As wide and open as a road can get! Examining my injuries made them really hurt and my head spin. I felt faint and queasy, not least because of the thought of the mammoth task required to sort out the bike and get back on the road. I sat under the tree, thinking it all through. Having not seen my parents for nearly two years, I dearly wanted to meet them in Kathmandu. But it was going to be a close-run thing. The Penang boat was the last to Madras for at least three weeks. If I made it and it docked on schedule in Madras, I’d have two weeks to ride north through India to Calcutta, and on to Nepal, a distance of about 1,500 miles to Kathmandu. And I had no idea what horrors the Indian roads might offer. After about an hour, I decided I’d had enough of the Thai family’s insistence to keep still. If I did nothing, I’d achieve nothing. I needed to check the damage on my bike. Walking around her, examining her more closely, I found her looks had taken a severe battering. Her silencers were dented, her headlight smashed. There was a large dent in her tank and scratches all over. But these were just cosmetic injuries. The physical state of her exhaust pipes and cylinders concerned me more. Having taken the brunt of the collision with the tree, one of the exhaust pipes now emerged from its cylinder at an acute angle, which would allow the exhaust gases to escape. Her other cylinder had a crash bar pushed hard against it and looked as if it might be bent. The keys were still in her ignition, so I twisted them. She fired up immediately, and didn’t sound too bad. Not for the first time, I thanked solid German engineering. Behind me, the family cheered, clapped, talked excitedly. I could guess that they were saying something like “What’s the problem? Everything’s fine,” but I frowned and pointed at the base of one cylinder. Oil was pouring out. I suspected a broken gasket. A young man, who I guessed was one of the sons of the woman who’d dressed my wounds, shrugged, handed me a dirty rag, then smiled. He seemed to be suggesting that this was all that was required to deal with the problem. I shook my head. It wouldn’t do. Not all the way to Penang, it wouldn’t. A pick-up truck drew up and the eldest son jumped down, bare-chested, his hand held out with a smile. He pointed with his thumb at the truck. “Doctor.” The first word of English I’d heard in several days. For a moment I considered refusing his offer, then I gave in. It made sense. He helped me into the truck and sat beside me, explaining that he’d learnt English at school. He had more English than I had Thai, but not enough to keep up a conversation all the way to the small clinic he drove me to, where a nurse looked at my cuts, wrote tetanus on a card, raised her eyebrows. I nodded. The workshop had everything I needed, including a vice to straighten my bike’s bent exhaust pipes. I explained in sign language what I needed to do and returned with my bike a short while later, chugging and trailing oil. I started work with the owner of the shop helping me, but he soon realized that I knew more about my bike than he did and left me to it, only helping me when I couldn’t hold a particular tool in my bandaged hands. Struggling at times to grasp even a spanner, I stripped down the cylinder, taking two hours to do what I would normally do in one. Rural village life along Elspeth’s journey. As I worked, an entirely male audience built up around me. I guessed they’d seen very few tourists and probably none that were female motorcyclists. Standing in a semi-circle around me, they pointed, exchanged comments, clearly not knowing what to make of me or my bike. I ignored them, concentrated on nursing my bike to health until the mood suddenly changed. A Thai woman had arrived. Slowly, other women joined the crowd and started talking. As the women’s voices started to match, then drown out the men, I wondered what was going on. Then, as I was loosening a bolt, I felt a slap on my back. 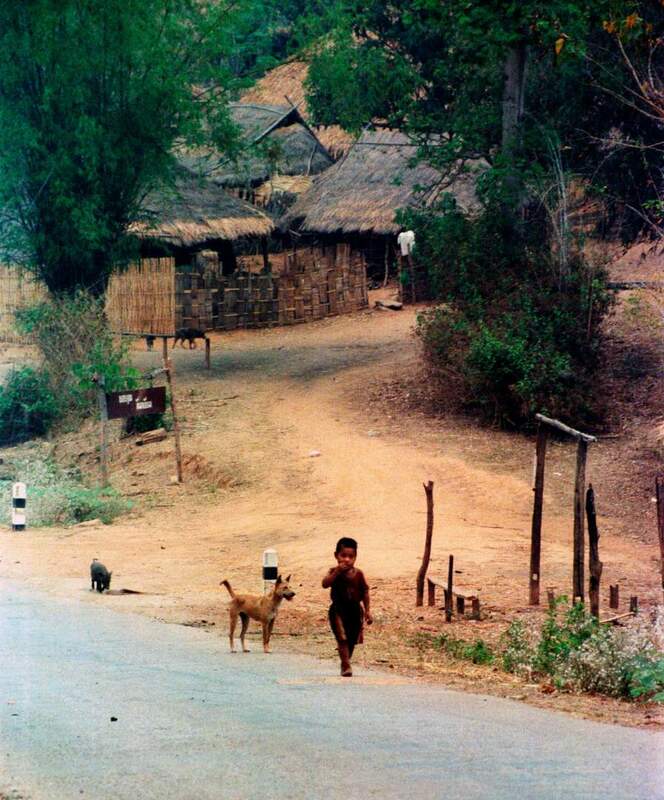 I turned around slowly and was greeted by the sight of a young Thai woman with a raised thumb and a broad smile. Unable to share a single word, I knew exactly what she wanted me to understand. Our lives and circumstances were very different, but from the glint in her eyes I knew exactly what she wanted to convey. “You and me, we’re the same,” she was saying. Something flashed between us and I realized we were united in our common cause. I knew that she wanted to prove to the men standing idly around, watching and talking about a woman doing something that was traditionally associated more with them than with women, that we were just as capable as any man, if only given the chance. Smiling and nodding conspiratorially with the Thai woman, I turned back to my cylinder. It appeared undamaged, but as I’d suspected, the base gasket was damaged. I found a spare in one of my bashed-in metal panniers, fitted it, then bent the exhaust back into shape as far as I dared without risking a crack in it. I fitted the exhaust to the cylinder, filling the gaps around it with asbestos fiber to seal any gaps. By now, I’d been working on my bike for more than two hours. It was even longer since the dog had knocked me off it. The sun was blisteringly hot and just as I was starting to lose strength an old man on a Honda scooter pulled up beside me in the other bay of the workshop. He mimed drinking from a can and eating a bowl of noodles, then pointed at the pillion on his scooter. I climbed on and rode for a few hundred meters to the village center, where we stopped beside a food stall. He showed me to a plastic chair as a bottle of cold Coke was pressed into my hand. Small kids surrounded me, poking my skin as if I was oblivious to it. A woman passed me a plate of food and a spoon. The kids pressed closer, their eyes following every spoonful of food from the plate to my mouth, fascinated, I guessed, to see how Westerners ate. Giggling as they stared, they obviously found me very amusing. When I’d finished, I patted my trousers for my wallet, but the man and woman immediately tensed. I mimed paying them, but they shook their heads. I was their guest, they explained in gestures. Any attempt to pay them would be refused. Grateful and touched by their generosity when they clearly had so little, I rode pillion on the little Honda back to my big BMW, humbled by the awareness that it was worth many times what any of my hosts would earn in a year. It took me another hour to finish my engine repairs, by which time most of the men had wandered off, although the women were still watching closely. With a smile and what I hoped my audience of ladies would take as an ironic flourish, I started the engine. It roared into life. No oil leak. No escaping exhaust smoke. I was back on track. Now I just had to hope my injuries would repair as easily. I thanked the shop owner, offered him some money, but he simply shook my hand and his head. He wouldn’t let me pay for anything. I rode back to the farm where the family had kindly offered to look after my bashed up metal boxes while I’d been at the bike shop. I started to rebuild my metal pannier boxes, but my hand injuries made drilling and riveting very difficult. The three sons had never seen a pop rivet gun before and were very happy to help. I pointed where I needed them to drill and rivet. They did the rest, all of them cheering every time they popped one. By the hundredth rivet, the novelty had worn off for me, but not for the three brothers, who continued repairing my boxes. By dusk, we had fixed them back onto my bike and I was ready to leave. Bats were swooping in the failing light as, gesturing towards the farmhouse, the three brothers insisted I should stay with their family until I had fully recovered. In no mental or physical condition to ride, I gratefully accepted and was shown into a small room next to the kitchen. It had a wooden floor and no furniture except for a 24-inch television, huge by the standards of the day. Sitting on the floor, next to the sons, watching television for the first time since I’d left Sydney six months earlier was utter bliss. Unable to understand a single word, I enjoyed every minute of it, my mind zoning out, my body relaxing properly for the first time in ages. 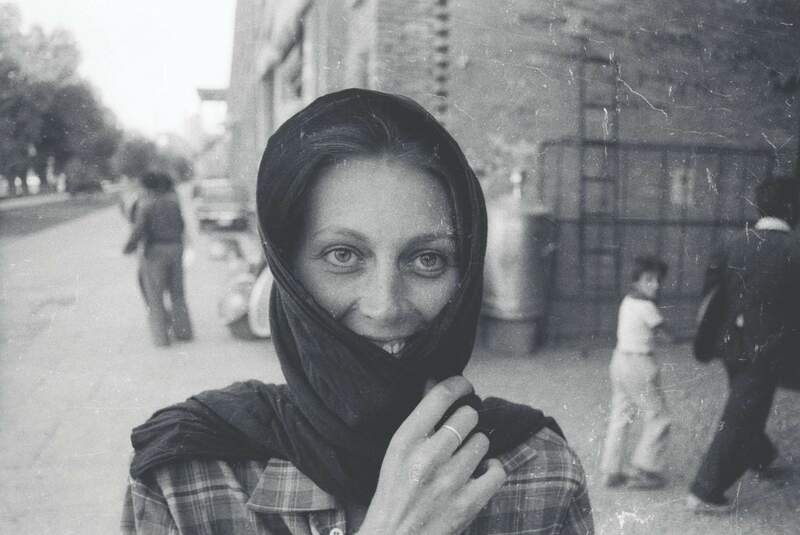 I was starting to drift off when the mother of the house beckoned us to dinner and we shuffled out of the room to eat rice, vegetables and meat, sitting outside on benches around a long table under a corrugated iron roof. After dinner, we went back to watching television until the programs ended, when the mother brought in a pile of blankets. Taking one each, we lay down beside each other: father, mother, grandmother, the sons and me and went to sleep. Or in my case, tried to go to sleep. Bruised all over, aching in every muscle and limb, I found it impossible to get comfortable on the hard floor, tossing and turning through the night. It was hot and sticky, but if I removed the blanket, the mosquitoes descended and I got bitten all over. Eventually, delirious with exhaustion, I drifted off into a fitful sleep. And so it continued for two days and three nights, a simple routine of lazing around, sleeping and watching television, eating rice, meat and vegetables, while my body healed itself. At times I wondered if it might be marginally less painful to ride my bike to somewhere with a comfortable bed but I enjoyed being part of a family again. Watching them go about their daily routine not only gave me an insight into the life of a typical Thai family, but also made me realize how much I missed being in the bosom of my own clan. On April 17, the day before the Madras boat was due to sail from Penang, I felt ready to leave. I packed up my things, then went to say goodbye to all the family. I found the mother in the kitchen and wandered over to thank her for her extraordinary hospitality. Clutching her small bottle of curo, she extended a creased hand and offered me the antiseptic. I was very touched and leant towards her, intending to hug her, but my eyes were drawn to something extraordinary behind the woman, on the table. The dog I’d run over. Most of the animal was missing, but it was unmistakable. The knife marks were straight and clean, the work of a skilled butcher. Well, that explained the generous portions of meat with every meal. For a few moments, not knowing what to say or do, I hesitated. Then I accepted the offer of the curo, clasping my hands together in front of my chest and bowing my head with a smile to show my thanks. Once I’d got over the thought of what I’d been eating for the last week, I realized I felt comforted to know what had happened to the dog. I had killed it and provided food for the family. No wonder they were so welcoming to me. I was determined to make up for lost time, and although I had abandoned any hope of catching the cargo boat to Madras as planned, I hoped I could find another way. I was spurred on by a deep desire to get to Kathmandu by any means so that I could be reunited for a short time with my parents. Eighteen months had passed since they waved off a rather reluctant traveller from Heathrow. It was a long time and I really needed to see them. 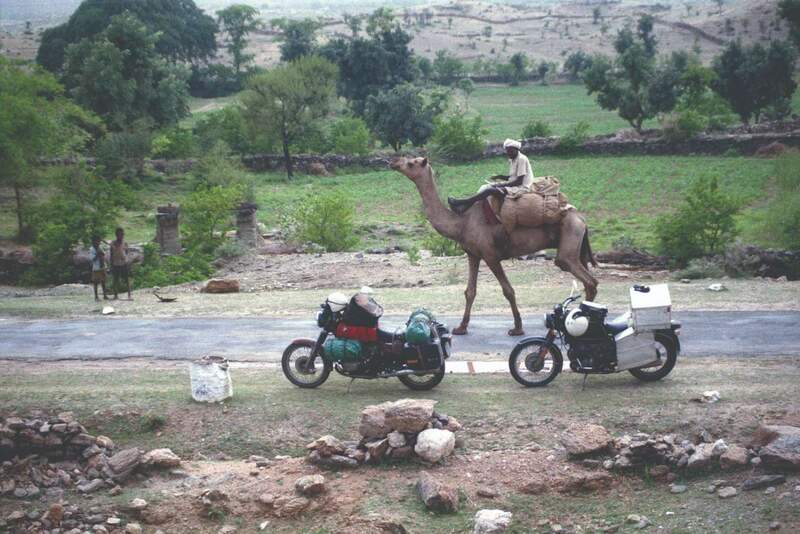 Excerpted from the book Lone Rider: The First British Woman to Motorcycle Around the World, by Elspeth Beard. Published by Octane Press, order it here. Elspeth Beard is author of "Lone Rider: The First British Woman to Motorcycle Around the World." She's a lifelong motorcycle globe-rider, and award-winning architect in Britain, where she specializes in creating unusual buildings and reinventing old ones like churches and water towers. She still rides, and is hoping her book reaches women in particular, who might see the value of (their own version of) hopping on a bike and speeding off into the blue yonder. You can buy her book on Amazon.